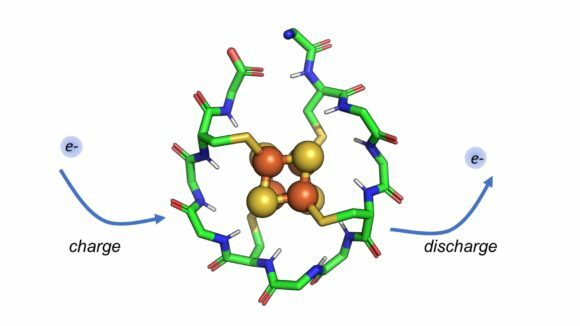 Share the post "Paul Falkowski and Fellow Rutgers Scientists Identify Protein That May Have Existed When Life Began"
Researchers have designed a synthetic small protein that wraps around a metal core composed of iron and sulfur. This protein can be repeatedly charged and discharged, allowing it to shuttle electrons within a cell. Such peptides may have existed at the dawn of life, moving electrons in early metabolic cycles. Image: Vikas Nanda. The scientists used computers to model a short, 12-amino acid protein and tested it in the laboratory. This peptide has several impressive and important features. It contains only two types of amino acids (rather than the estimated 20 amino acids that synthesize millions of different proteins needed for specific body functions), it is very short and it could have emerged spontaneously on the early Earth in the right conditions. The metal cluster at the core of this peptide resembles the structure and chemistry of iron-sulfur minerals that were abundant in early Earth oceans. The peptide can also charge and discharge electrons repeatedly without falling apart, according to Nanda, a resident faculty member at The Center for Advanced Biotechnology and Medicine. Study co-lead authors are John Dongun Kim, postdoctoral researcher, and graduate student Douglas H. Pike. Other authors include Alexei M. Tyryshkin and G.V.T. Swapna, staff scientists; Hagai Raanan, postdoctoral researcher; and Gaetano T. Montelione, Jerome and Lorraine Aresty Chair and distinguished professor in the Department of Molecular Biology and Biochemistry. 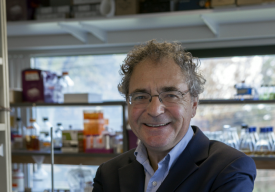 He is also a resident faculty member at The Center for Advanced Biotechnology and Medicine.